For Mera Tiernahrung GmbH from Kevelaer on the lower Rhine in Germany this is both a goal and an obligation. For over 60 years this German family-run company has gained experience in the production of high-quality pet food. The company has ultra-modern manufacturing facilities and is among the leading manufacturers of premium products for dogs and cats. To do this, the entire production process meets the requirements of the strictest international quality standards and is regularly reviewed and certified by independent institutions. High-quality raw materials are subject to extensive quality checks even upon delivery to us. In addition there is seamless traceability from the finished product to the raw material supplier. This guaranties safety for both people and animals. We use only raw-materials from healthy animals whose meat is intended for human consumption – monitored and confirmed by official veterinarians. Raw materials are sourced off the European market and the meat used is growth hormone, stimulant and anti-biotic free. Mera have had zero recalls or pet food scares in more than 60 years. It is a basic principle of the Meradog brand to provide dogs with tasty products which are at the cutting edge of nutritional science. The high-quality food for dogs is produced in Kevelaer on the lower Rhine. With its solid knowledge of dogs’ needs, Meradog develops advanced dietary concepts which make the dogs’ lives the primary focus. All Meradog products meet the constantly growing demands placed on healthy and responsible food for dogs which is at a remarkably high level of quality. The innovative food recipes are developed and tested by qualified nutritionists. They comprise high-quality, natural ingredients with which the special needs of dogs can be covered in the different life phases. Using this as a basis, Meradog offers an extensive and varied line of stand-alone products for all life phases – from puppy to senior. Our dog food, which is always setting new standards in innovation, quality, and digestibility, is produced at one of the most modern production facilities in Europe. Meradog provides your dog with the exceptional MERA quality in every phase of its life: We use only the raw materials from healthy animals whose meat is intended for human consumption – monitored and confirmed by official veterinarians. We manufacture our dog food responsibly using green electricity. 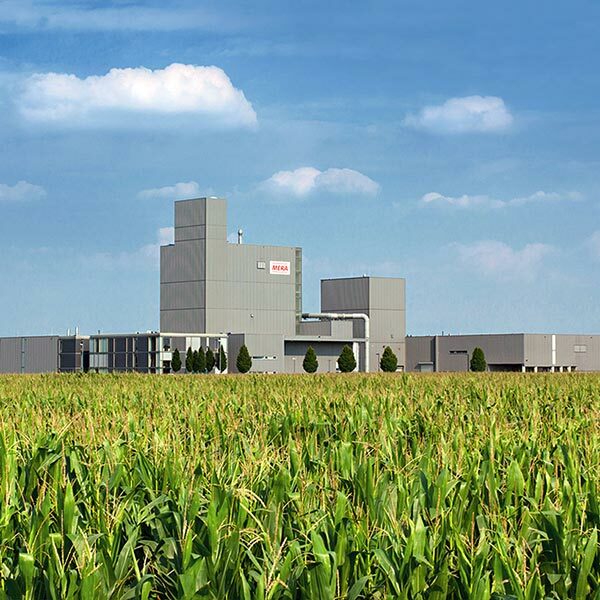 At our production location in Kevelaer on the Lower Rhine the production facilities for stand-alone dog and cat food as well as baked goods consume a notable amount of gas and electricity. The discussion on sustainability clearly indicates that we should all be conscientious in terms of our responsibility to protect the environment. We therefore produce all of our products with 100% Eco-power. On average we save around 3175 tons of CO2 each year. Eco-power (green power) is power of which 100% was obtained from renewable energy sources – water, wind, sun or biomass. The power which we consume is primarily obtained from water power. Because there are no separate networks for traditional electricity and eco-electricity, it can no longer be physically determined in the power network which type of power is currently being consumed. Therefore there must be a controlled comparison between the generation and the consumption. In our case, what is called the RECS certificate (exact information at www.recs-deutschland.de ). We ensure that the power generated by us originates from regenerative generation plants because our power utility must redeem a corresponding certificate for each megawatt hour used by us on this quantity. These certificates are issued upon generation of the power by the operator and sold via a data base system to our power supplier and redeemed upon consumption and stamped. This process ensures that at all times the path of any proof of origin is issued can be tracked from generation to certificate redemption. In this way, the amount consumed at the final count always corresponds to the amount of eco-power fed in . The independent and neutral Öko-Institut e.V., Freiburg monitors and controls the process. The family-run company Mera has always been known for its entrepreneurial spirit. Karl Vos began building up the then mixed feed factory with characteristic determination in 1949. Deeply rooted in the rural region around the town of Kevelaer, he was quick to recognise the growing signifiance of animal food production in Germany. Thanks to agricultural developments, the company was able to expand, and finally began to specialise in the production of calves’ milk in the 1960s. When Bernd Vos made successful investments in the growing pet food market at the beginning of the 1980s, he set the course for the company’s current position. Take a look inside the home of one of the worlds most advanced manufacturers of premium dog and cat food.